Greater Dandenong Council has been asked to tip in $1.25 million towards the Team 11 A-League bid, if successful. Last month, Team 11 requested that Greater Dandenong and City of Casey each purchase 1.25 million equity shares in the club. The $2.5 million funding would help establish the A-League and W-League clubs, as well as go toward the A-League licence fee of up to $15 million. In return, the two councils would appoint an extra director to the club’s board of up to 13 members. 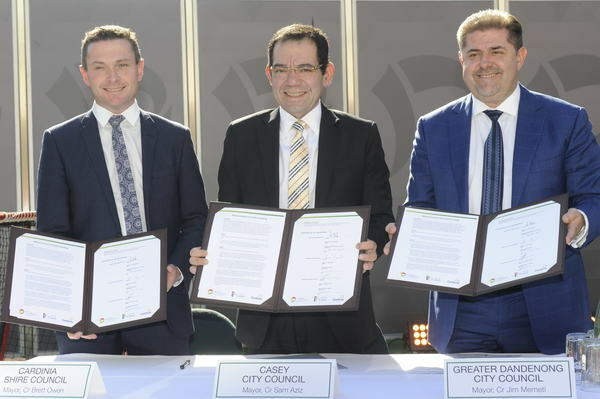 Currently, Greater Dandenong, Casey and Cardinia councils are represented by Greater Dandenong Business group manager Paul Kearsley on the board. Councillor Jim Memeti said the move would make the councils part-owners of the club. “It shows investors that we’re dead serious about this commitment. Cr Memeti said the club was also backed by sufficient private investors such as Jayco owner Gerry Ryan and developers Intrapac and Pellicano. A council report in favour of the move stated that Greater Dandenong could receive a return on its shares, in the form of increased share prices and dividends. Cr Memeti said besides the dividends, the council will make its money back “over and over” due to the tourism and jobs boost. The A-League team would be a boon for grassroots football participation, the region’s economic growth and social cohesion, according to the report. The investment, less than 1 per cent of the council’s $139 million annual revenue, is unbudgeted by the Council. It will be referred to the council’s mid-year budget review. Councillors are set to decide on the funding on 10 December. It would depend on the success of Team 11’s bid. Football Federation Australia is expected to announce the two successful bids soon after a board meeting on 12 December.